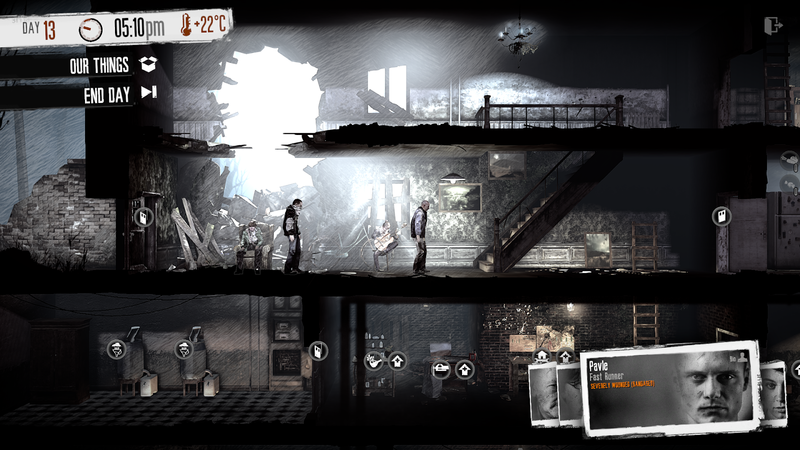 This War of Mine is a war game that stands out from the crowd. Instead of telling the story of soldiers, the game focuses on a group of civilians living in a besieged city. The group must struggle to stay warm, fed and healthy in order to survive the brutal conditions of the war zone. This is a game with depth, both mechanically and emotionally. The city is in shambles, so players must manage limited resources and decide how to use them. These resources, like wood, food, or weapon parts, can be found in limited supply around the survivors' house or traded for with travelling survivors. The in-game economy is dynamic: for example, the value of certain resources fluctuates depending on their scarcity, and people in dire need will give you more for items they desperately need. Scavenging at night is the best way to gather resources. Since snipers are abundant during the day, the group stays indoors while the sun is up. But at night, one person can risk venturing out into the city to scavenge what they can. The type and amount of resources you find depends on the location in which you choose to search. What makes these night-time scavenging missions interesting is that you can encounter other people. These may be other scavengers, inhabitants, soldiers, etc. Some people are willing to talk or trade, while others are hostile. Who can you trust? The difficult living conditions of the war can push people to commit drastic actions. The game’s stealth and combat systems are intuitive and great, so it feels satisfying to sneak around others or fight for loot. There are also interesting events and situations that can unfold while you’re out at night, and I was pleasantly surprised to see that your reactions to these situations are reflected in the plot. 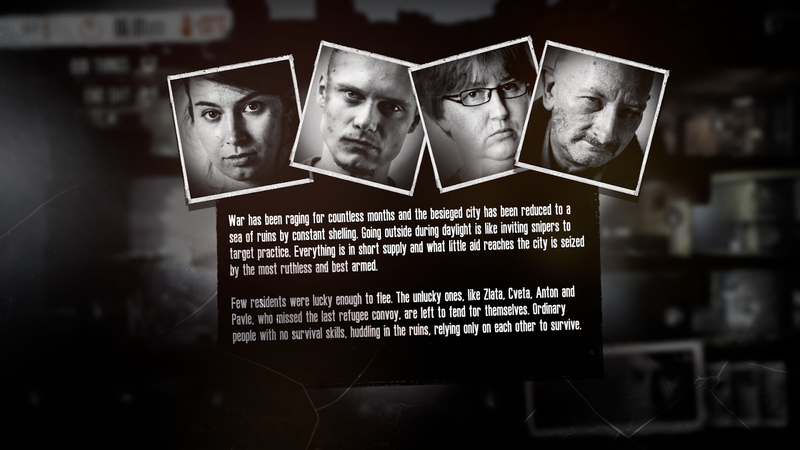 This War of Mine presents the player with many moral choices. When food is running low, who gets to eat and who doesn’t? Who gets to sleep on the bed, and who sleeps on the floor? Why? There are also many random events that mix things up and create tough choices. But even with these text-based events, most of the choices emerge naturally through gameplay. When the going gets rough, will you resort to stealing from other people? The game does a good job of making it clear when you’re simply scavenging from rubble and when you’re stealing someone else's stuff. Your characters even begin to question their actions and react to what they’ve done. For example, members of the group may feel sad about stealing from the hospital or happy after helping out a neighbour. I was impressed that the survivors’ mental well-being is so effectively factored into the game. 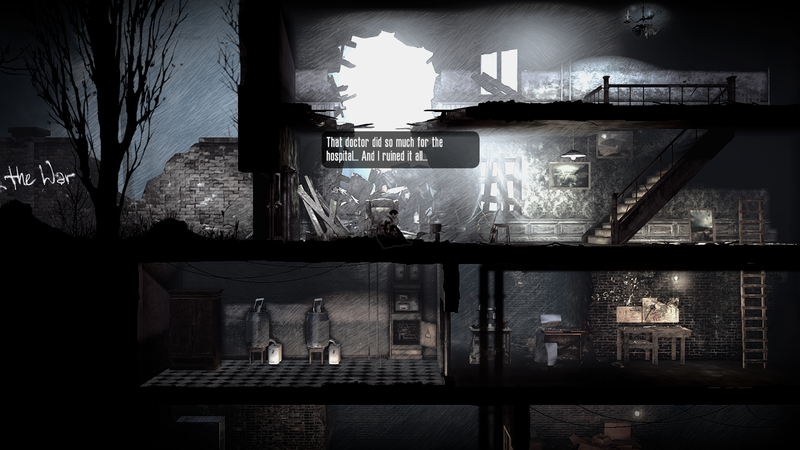 The characters’ dialogue will reflect how they’re feeling about the situation (as can be seen in the above screenshot). In addition to these story cues, there are actually mechanics built around these feelings. For example, two kids came knocking at the door asking for valuable meds to help their sick mother. I gave it to them, but I figured there would be no in-game consequences other than losing the meds. But shortly thereafter, the survivors discussed it. “I’m glad we helped out those kids,” someone said. And much to my surprise, listed alongside health statuses like hunger and sleepiness was an indication that they were content. I later discovered that characters can become sad or even depressed when losing a friend or committing vicious crimes, for example. New events and mechanics even appear as characters lose determination and hope. Mental health must be taken into account, which is not something you see often in video games. 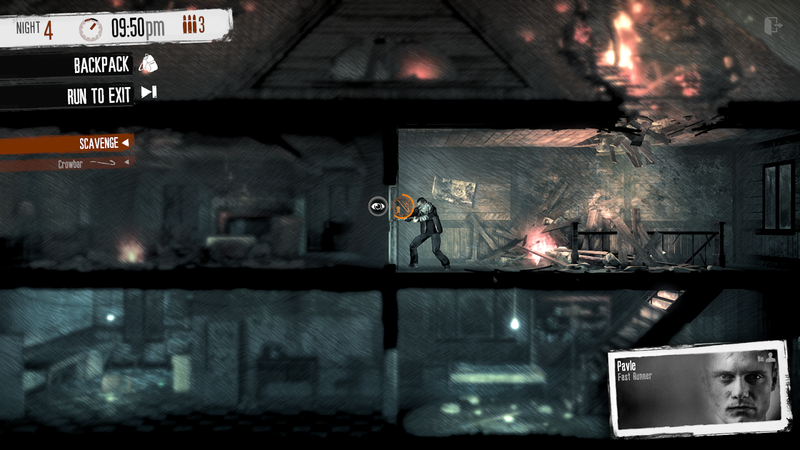 In This War of Mine, you don't hold X to feel something. Your actions and emotional state are seamlessly intertwined. Having one of the group members die doesn't just mean losing a pair of hands : his or her passing is discussed and saddens the group. This is a totally normal and human thing to happen, yet most games treat characters like generic interchangeable units. Not This War of Mine. Characters also have a back story and a real-life image for their face, which further humanises them. Playing This War of Mine is an intense experience. The game makes the player live through challenging, bleak, and sometimes brutal situations. I began most runs hopeful, but somewhere down the line, things always went bad. After someone died or after suffering a particularly devastating raid, I felt like restarting and taking another crack at it. But that must be exactly how people feel in such situations, as if struggling is futile. There are a few problems with the game, but nothing that ruins the experience. For example, why can only one person go scavenging at night? And why can this person only visit one location? I've gone to the wrong location by mistake, as well as visited a new location only to learn that I didn't have the proper equipment, which sort of wastes your scavenging opportunity and makes the game even harder. I would suggest making it possible to visit more than one area, but that a little time would pass when moving.